The 'star' of "Pearl Harbour", an actor always considered to have a potential that he repeatedly failed to live up to, with aspirations of being a big shot director. A big budget crime thriller styled after Michael Mann's classic, "Heat". It's a combination which in many ways seemed doomed to fail and i'll happily admit i had my reservations when i first heard about the project. If you haven't guessed already, i'm talking about "The Town" and the man in question is Ben Affleck. The 38 year old American has had a pretty mixed career, with several serious bum notes, but in the last 5 years his career has undergone a bit of a resurrection. He's started directing films as well as continuing to act and contrary to my initial belief, he's made me completely re-evaluate my view. I watched "The Town" this evening, the second time i've seen it, and it was every bit as good with a repeat viewing. It was the second best film i saw at the cinema in 2010, only pipped by the frankly stunning "Monsters". 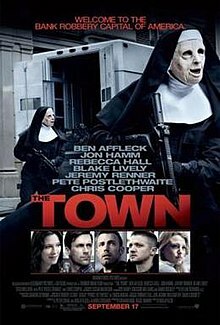 You can't watch "The Town" without comparing it to the 1995 Pacino v De Niro bank heist movie, but i don't see that as a criticism. Affleck's effort is excellent in it's own right, learning lessons from arguably the best example of the particular genre, without ever just becoming a poor homage to it. The action scenes are perfectly directed, sharp and clinical, yet brutal and kinetic throughout. The central characters are well developed, with some genuine depth and complexity. It's definitely a film focussing on the people on the criminal side, with the main FBI character, played by Mad Men's John Hamm, given very little time to do anything other than scowl and make vague threatening statements. However it's excusable when the criminals are so engaging, and the relationship between Affleck's character and Rebecca Hall's is surprisingly believable given the context. Jeremy Renner is superb as Affleck's violent but loyal best friend, definitely deserving of the Oscar nomination he got. It's the kind of film where much of the plot and many of the characters are rife with potential for becoming clichéd, yet the execution of them means it remains brilliant throughout. It's a film that is powerful, tense and manages to tow the line between showing the criminals as real people and glorifying the criminal activity. I definitely intend to watch the film Affleck directed in 2007, "Gone Baby Gone", which starred his younger brother. There seems to be a definite chance that he may end up with a career that he can be proud of, where he may even be forgiven for his complicity in "Pearl Harbour".